How many grams in a teaspoon? With this grams to teaspoons calculator, you'll quickly convert between grams - the basic unit of weight (mass) in the metric system - and teaspoons, which are a measure of volume often used in cooking. Wondering how many grams of sugar in a teaspoon? Want to know how many teaspoons are in a tablespoon? Have baking powder in grams in a pancake recipe, but you prefer teaspoons? We've taken care of everything! Scroll down to read more about grams to teaspoons conversion or have a quick look at the conversion table for fourteen ingredients which often appear in the teaspoon unit. Be careful, though - staying in the US doesn't exactly mean that you'll find only US teaspoons there. For example, in nutritional labeling and medicine, the teaspoon always has 5 ml, which is simply the metric teaspoon. But how many teaspoons are in a cup? So we quickly found out that there are 48 teaspoons in one cup. Well, it's impossible to answer without additional information, as it depends on the product density. As you intuitively know, there are differences in the weight of a cocoa powder teaspoon and how many grams of sugar are in a teaspoon. But no worries! This, grams to teaspoons calculator is here to help you. Experiment with our tool, choose different products or type in their density, and we'll find the weight of the ingredient in grams or volume, measured in teaspoons. As the differences between metric and US tsp are minor when dealing with only one spoon, we've averaged that value. More inconsistencies are brought by differences in density of the products coming from various manufacturers. So remember that the table above (and grams to teaspoons calculator itself) is a rough approximation and can be used in everyday life, but not necessarily when high precision measurements are needed. 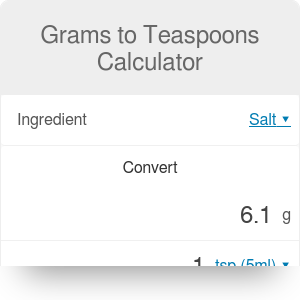 Thanks to the grams to teaspoons calculator and table you've discovered that a spoon of sugar weights around 4.2 grams. Wondering how many calories are in a teaspoon of sugar? It's estimated that one teaspoon of sugar contains 16 calories, and one tablespoon contains 48 calories. Did you notice that one can of almost any type of soda exceeds our daily recommended amount of added sugar? We didn't count other products eaten every day, such as dairy, cereals, fruit drinks, cakes and candies, dairy desserts... Sum all of those, and the amount of added sugars will shoot through the roof - don't wait any longer, rethink and change your diet! We can help a bit: whether you try to exercise more or eat healthier, our resolution calculator is a must if you're seeking motivation. Need brutal type of incentive? Have a look at your BMI, body fat and blood sugar calculators. Also, our big collection of sports calculators may be useful to change your lifestyle. Grams to Teaspoons Calculator can be embedded on your website to enrich the content you wrote and make it easier for your visitors to understand your message.